Over the past years, comprehending the Party’s military and defence guidelines, the Military Region 1 has focused its leadership and direction over the synchronous adoption of various measures to enhance the quality of training and combat readiness, providing the basis for the Military Region’s armed forces to fulfil all the assigned tasks. Perceiving the importance of training and combat readiness tasks to the improved synergy and combat strength of the Military Region’s armed forces, over the past years, the Military Region’s Party Committee and High Command have attached great importance to leading and directing its affiliated units to synchronously take measures to make a breakthrough, dramatic, comprehensive change in this work. It is worth noting that the Military Region’s cadres and troops’ awareness and responsibility for the task of combat training have been considerably raised. The work of training support has been conducted in a sufficient, timely, and elaborate manner. There has been a great deal of creative in training plans which have been designed in accordance with groups of troops and adjusted flexibly to meet the requirements set by contingency missions. Leadership, direction and operation of party committees and commanders, directly advisory - training management organs at all levels, have been gradually innovated on a close, scientific basis and gained practical effectiveness. Training method of cadres at all levels has witnessed positive changes. Annually, the Military Region has held training course for all its troops, ensuring 100% of the training content and duration according to pre-determined plans and programs. Results of training and exercises have been quite comprehensive and stable. Results of inspection by the Ministry of National Defence reveal that the Military Region has always successfully fulfilled the training task, contributing to safeguarding national sovereignty in border areas, maintaining security and politics, and facilitating localities’ socio-economic development. A part from the obtained results, several party committees and commanders’ leadership and direction over the work of training preparation have yet to be effective. The quality of training the reserve force and militia and self-defence forces and conducting district-level defensive zone exercises and commune-level defensive exercises in a number of units and localities has yet to be high. Those weaknesses have partly affected the Military Region’s results of training. 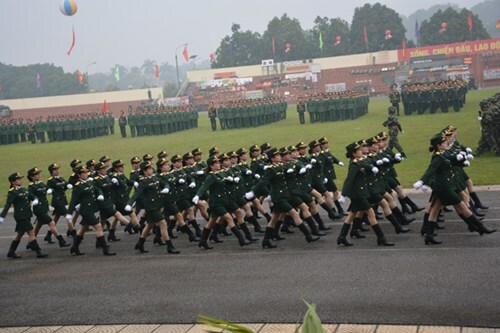 In the coming time, to improve the quality of training and combat readiness, the Military Region’s affiliated units should continue to grasp and implement the military and defence guidelines of the Party, the Central Military Commission and the Ministry of National Defence set in the Resolution of the 12th National Party Congress and the Resolution of the 10th Army Party Congress, with a focus on the Resolution 765-NQ/QUTW, dated December 20th 2012, on “improving the quality of training in the 2013-2020 period and beyond”. Moreover, it is necessary to focus on leading and directing the Military Region’s armed forces to actively, resolutely overcome difficulties and weak points, and to take measures for the improved quality of training and combat readiness as follows. First, enhancing the all-level party committees and commanders over the tasks of training and combat readiness. This is both a requirement and a matter of principle in order to maintain and enhance the Party’s leadership and commanders’ direction over the task of training, ensuring that this task will be well oriented and achieve high efficiency. On the one hand, the Military Region’s Party Committee and High Command have directed its affiliated units to improve the capability of leadership of all-level party committees, with a focus on leadership over training and combat readiness. Affiliated units of the Military Region are requested to review and complement the regulations on leading the task of training; to improve the quality of specialized resolutions on training; to well review the results of training and draw lessons; to innovate and enhance the quality of leadership resolutions, particularly in commune-level party committees and cells. Moreover, party committees and organizations at all levels should step up innovation of content and method for carrying out the party and political work for training and combat readiness tasks, focusing on clarifying responsibility of commanders at all levels. Due attention should be paid to the admission of new party members in active and local units as well as militia and self-defence and reserve forces. Significance should be attached to inspecting, supervising and training party members according to the Resolution of the Party Central Committee’s 4th Plenum (12th tenure) on party building and rectification as well as the Politburo’s Directive 05-CT/TW (12th tenure) on acceleration of studying and following Ho Chi Minh’s thought, morality and lifestyle, ensuring that this staff will be qualified enough to lead, direct and effectively implement the tasks of training and combat readiness. On the other hand, the Military Region’s Party Committee and High Command have directed its units to seriously execute the Regulations on Grass-Roots Democracy; to promote the role of organizations, such as Youth Union, Women’s Union, Soldiers’ Council and so forth in training; to resolutely remedy signals of subjectivity and irresponsible leadership. Second, innovating content, forms and methods of training. Grasping and realizing viewpoints, directions, goals and requirements for training, mentioned in resolutions, directives and orders of the Central Military Commission, Ministry of National Defence as well as the Resolution of the 10th Army Party Congress, the Military Region’s Party Committee and High Command have directed its affiliated units to actively innovate content, forms and methods of training practically, effectively in line with each group of troops and unit’s area and missions. During the process of training, importance should be attached to viewpoints, principles, motto of “basics, practicality, thorough grasp” and specialized training relevant to combat condition, particularly in hi-tech and electronic warfare waged by the enemy. Adhering to the Training Order by the Chief of the General Staff and realities, annually, the Military Region’s Party Committee and High Command have directed its affiliated units to innovate the content and programs of training and exercise intended for groups of troops (active troops, local troops, reserve force and militia and self-defence forces), ensuring that training must be comprehensive but focalized, and that troops could master new weapons and equipment during combined arms and services operations. It is important to diversify forms and methods of training, closely combine military training with political education, basic, regular training with in-service, supplementary training. Due attention should be paid to night-time training and field training combined with mass mobilization to help people eradicate hunger, reduce poverty and build new-type rural areas. It is essential to actively innovate the methods of training and cultivating cadres to improve their comprehensive capabilities, with a focus on the capabilities to practise training, manage troops, and build comprehensively strong units. During the course of training the recruits, the Military Region has directed its affiliated units to employ visual, concise, easy-to-understand methods and convey the Military Region’s armed forces’ experience and tradition as well as combat projects and projects for fire and explosion prevention and combat by units and forces. Moreover, the Military Region’s High Command has directed its affiliated units to well conduct live-fire exercises and cooperate with localities in organizing all-level defensive zone exercises. In 2017, the Military Region’s armed forces took part in the DT-17 exercise conducted by the Ministry of National Defence and successfully fulfiled all the assigned tasks, which was highly appreciated by higher echelons. Thanks to the exercises, all-level cadres’ capabilities of command and operation have considerably improved; the combat coordination between the Military Region’s units and components in the defensive zones at all levels has been ensured closely. Third, innovating the work of directing, managing, operating and supporting training. To achieve the goals set by the Central Military Commission’s Resolution 765 and the Military Region’s Party Committee’s Resolution, the Military Region’s High Command has directed, managed, and operated the training task closely in conformity with the stated process via the annual order and plan on training. The Military Region’s functional organs, particularly the Training - School Office and the Operations Office, should further innovate the work of commanding, managing and operating training and exercises on a “focalized, synchronous, effective” basis. Those organs should direct units to consolidate and promote the role of their advisory, training-operations offices, particularly at regiment and division levels (district and provincial military command levels). Emphasis should be placed on counselling commanders at all levels to direct the training task via commands and directives; to manage this task via regulations; to operate it via plans. Besides, units should accelerate application of information technology to the process of management, operation and practice of training and exercises; while innovating forms and methods for inspection. In this regard, it is necessary to step up unscheduled inspection and verification of results of training to correctly review units’ training work, thereby overcoming weaknesses, recommending solutions to improving the quality of training and combat readiness within the Military Region’s armed forces. In addition, the Military Region’s High Command has directed its affiliated units to actively innovate logistics and technical support in a sufficient, timely, synchronous, close manner with priority given to units and forces responsible for important tasks; to closely combine the maintenance of financial resource with that of material, petroleum, and equipment and other assets. Thanks to innovation and effective command, management, operation and support of training, the Military Region won top prizes in Ministry-level competitions; particularly, it won the runner-up prize in the 2017 Army-wide Sports Competition. Effective implementation of the above-mentioned measures will contribute to improving the synergy and combat readiness capability of the Military Region’s armed forces, meeting the requirements of national defence in the new situation.